Today Febuary 3rd is National Wear Red Day. “Go Red for Women” is in celebration of women bonding together to create awareness and fight heart disease. It’s a good time for each of us to reflect on how we might change our lives in order to lead happier, healthier lives. It doesn’t always have to be big changes, we can make several small changes to our lifsestyle that can result in being healthier. For example, I have decided to walk to work twice a week. It may not seem like a lot but in my case that is 5.2 miles per week, 270 miles a year and 27000 calories a year. Another small change you can make is increasing the amount of fruits and vegetables in your diet. I do this and limit the amount of fats in my diet and focus on eating lean protein. I suggest cooking with olive oil which is a monosaturated fat which is the healthiest one to incorporate into your diet – besides the fact that it tastes better. So in honor of day I am sharing a few of my favorite heart healthy dishes! Think about how you might lead a healthier life today! From by the bay wishing you healthy food memories! Place all ingredients into a bowl and mix well, Serve at room temperature. Fava beans – to pan of simmering water add shelled fava beans. Simmer for 2-3 minutes. Remove and place into cold water. Drain beans and remove bean from waxy casing. Use for salad. Fresh Spring Peas – to pan of simmering water add shelled peas. Simmer for 2-3 minutes. Remove and place into cold water. Drain and use for salad. Asparagus – snap off woody ends of asparagus. Cut into 2 inch pieces and to pan of simmering water. Simmer for 2-3 minutes. Remove and place into cold water. Drain and use for salad. Scallions- cut off ends with roots and tops using just the white and light green part of the scallion. Cut this into 2 inch pieces. Add to pan of simmering water and simmer for 2-3 minutes. Remove and place into cold water. Drain and use for salad. Tip: to make this process easier I use a strainer to remove the vegetables from the simmering water leaving the heat under the pan and keep reusing the hot water. 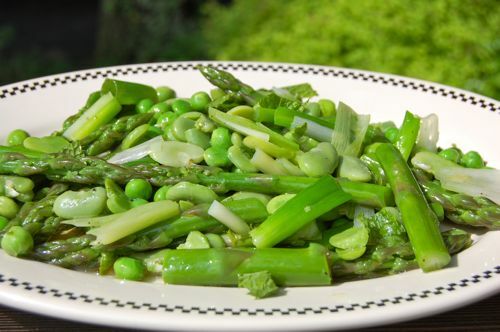 This entry was posted in salads, side dish and tagged asparagus recipes, fava bean recipes, green vegetables, spring foods, spring recipes, vegetarian recipes on May 24, 2014 by entertainingbythebay.